friday is the deadline for the missional entrepreneurship competition - don't miss it! excited to announce that cms and greenbelt are launching a missional entrepreneurship competition. get your idea in and then be ready to work it up and make a dragon's den style pitch at greenbelt festival! 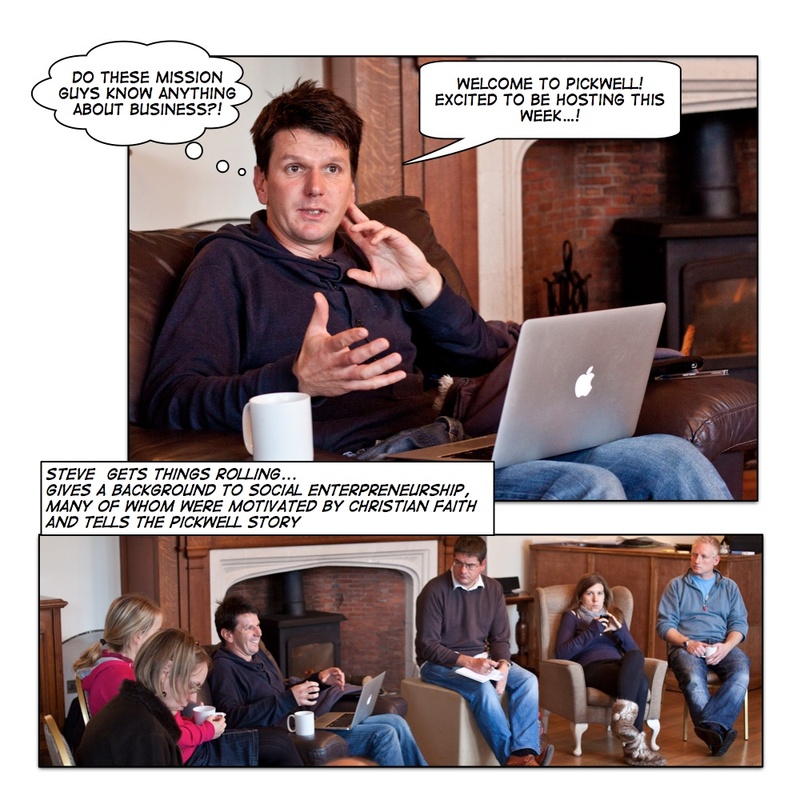 the first ever cms pioneer missional entrepreneurship week went really well! i have put together a photo story of the week to give you a flavour - click on the image above. we'll be running a week next year in november - dates yet to be finalised. but book early - i sense this is going to grow! i have been having computer hassles as you may have seen on facebook or twitter. turns out the model of macbook pro i bought was in a time with a batch of dodgy graphics cards but when i took it in to be fixed last time mac replaced it with the same dodgy logic board - not impressed! anyway hopefully this time round it will fix the perpetual crashing problem. i have to say it's brought a lot of joy to pc users to have a mac crashing. fortunately jen has kindly leant me her laptop for the week. it's scary how dependent we are on computers now. if you have e-mailed me recently and i haven't replied the chances are i won't for anther week! good to see andrew jones on his travels managed to drop in to the earthquake zone in turkey to dish out some much needed blankets. We are often better served by connecting ideas than we are by protecting them. ideas flow best in unregulated channels in open environments. this is instinctive to people in the new networked culture but much harder for organisations to wrap their heads round perhaps especially at times of financial pressure when to give and share may seem counter intuitive. in a fascinating piece of research johnson plots inventions in blocks of two hundred years along the axis of market/non-market and individual/network. it completely shatters the image of the lone inventor. the last two hundred years have seen by far the most innovation in the fourth quadrant - non market networked. he also talks about what he calls exaptation - borrowing an idea from one area and applying it to another. so for example the gutenburg printing press would possibly not have been invented if gutenberg wasn't interested in winemaking. his genius was bricolage from a number of different areas to create the printing press including ideas from the wine press. he also cites a survey of 766 entrpreneurs by ruef which highlights that the most creative individuals had broad social networks that were outside both their own organisations and their own fields of expertise. diverse horizontal networks were three tims more innovative than vertical networks. and groups that are familiar and long term tend to dampen innovation. i have blogged at length before about clay shirky's book here comes everybody - 1 2 3 4 which looks at network theory and the importance of connectors who focus outside of their small world to increase energy in networks which demonstrates in a different way the same point. one of the creative tips in a whack on the side of the head is to look outside your own area. margaret wheatley's magnificent book leadership and the new science suggests that a very different mindset is required in leaders who operate in this new environment of connectedness. some organisations have famously sought to encourage this in their staff. so google for example encouraged staff to spend 20% of time following up connections, exploring, nurturing hunches with great effect, enabling serendipitous moments. it goes without saying that the the internet has opened up connectivity in extraordinary ways. those people who moan about it and see it as a waste of time are somewhat missing the point. that's not to say that all internet use will lead to innovation. it's equally possible to live in a bubble with familiar connections and relationships and web sites that can be very dull and stagnant. instead explore tangents, follow hunches, get curious, connect with new people outside your area of interest and so on. so what? connect and nurture connections beyond your own area. meet people, drink coffee, exploring hunches, operate out of a posture that seeks to open source and share ideas rather than batton down the hatches. in terms of newness in the church which is of particular interest to me, this is a hard reflex to develop. theological positions are often entrenched and defended. people go to their tribe's festival, read their tribe's books, do their tribe's leadership training, meet their tribe in coffee houses and so on. it's easy to end up in a loop that is quite small, self referential and ultimately uncreative because of fear. this is equally true of progressive as of conservative as of emerging as of orthodox as of liberal as of evangelical as of catholic etc. by contrast, the body of christ is an extraordinary network of connections that opens up all sorts of amazing possibilities with a different set of instincts out of which much newness could and i hope will come. innovate or die! that statement sounds a bit drastic but could be applied to any organisation over time - culture changes and moves so fast that innovation is essential. it's one thing to say it, but how in practice can innovation be cultivated? there is usually a problem - the status quo! people like things the way they are and have vested interests in it. new ideas can be a threat, dangerous or heretical even. There can be no constructive change at all, even in church, unless there is some form of dissent. By dissent I mean simply the proposing of alternatives, and a system that is not continuously examining alternatives is not likely to evolve creatively. he suggests that for newness to take root, there are two kinds of dissenters - authority dissenters and pathfinding dissenters. i think there’s a parallel here in the language that has been used in the church in various places with permission givers/loyal radicals/sponsors perhaps being the equivalent of the authority dissenter and pioneers the equivalent of pathfinding dissenters. pathfinding dissenters devise ways to bridge the gap between gospel and culture. not only do they dream up appropriate strategies, but they actually move to implement them. they are dreamers who do - (i love this expression and used it as the title of my talks at breakout). given the challenge of preaching the kingdom within an ever changing world he says we need creativity of quantum leap proportions. renewal of existing strategies is insufficient. rather we require radically different and as yet unimagined ways to relate the good news to the challenges of the world. pathfinding dissenters are needed within the church to critique or dissent from the conventional and ineffective wisdom of the present. without these courageous people the church simply cannot fulfill its mission. the task and position of the authority dissenter is somewhat different. they are somehwere in the structures of an organisation or church able to make decisions with responsibility. their challenge is three fold. they need to spot and encourage and recruit pathfinding dissenters. this in itself isn't always easy. it's amazing how often safer options are chosen in leadership with whom business as usual is just fine. then secondly they are to use/deploy the gifts of the pathfinding dissenters for the benefit of the organisation/culture/church. and then finally they need to broker space for this dissent so that it can flourish without being forever under the glare and critique of those who like things the way they are. this relates to the tactic in the last post - the new belongs elsewhere - if it is to have a chance of genuine newness emerging. i think this recognition of the importance of dissent is inspired. one way i think about dissenters is as those who have the gift of not fitting in. they see and imagine differently. they can't help it. it's who they are. it's the gift that they bring. in terms of ministry in the church this is prophetic ministry. i have elaborated on this in my breakout talks so won't say much more than that here. jesus and all the prophets before him were dissenters who made the world new through their dissent. it is also the interplay between the two dissenting roles that is worth reflecting on and is often a hidden part of the complexity when newness genunely emerges. dave andrews identifies a very similar combination and in his writing the term he uses is sponsor - see for example his idiots guide to changing your church. he goes so far as to say that if you can't find a sponsor/authority dissenter don't get involved. let me give an example - st laurence church in reading. newness has come there in the form of creating a community that is innovating in the gap between gospel and the culture of marginalised young people. this has happened through the pathfinding dissent of chris russell and team and has flourished because of the authority dissenting of the arch deacon who brokered the space, the budget, and dealt with the challenge of the status quo of both the existing congregation and their interests and the politic of the diocesan strucures. dissent and the new belonging elsewhere sounds like i am advocating a leaving or separation from the church. but i am not. more about that in the next post - refounding. Want to start your own missional enterprise or project? How will it be sustained? How will you build a team? How will you measure the impact? In addition we will look at social enterprise and what it’s relevance is today, its history and what unique opportunities it provides. During the week you will be hands on working on a missional enterprise to tackle a social issue, engage community and do it in a financially sustainable way. The week will be led by Shannon Hopkins, founder of Sweet Notions and Matryoshka Haus social enterprises, and business entrepreneur Steve Baker (one of whose business endeavours is Pickwell Manor where we will be hosted). Cost – only £250 including food and accomodation. The axiom means that a refounding project should not normally be placed in the midst of existing works/structures, where prophetic people would be under constant critical assessment by members of the community and required to waste invaluable energy apologising for what they are doing. you see this in many areas of life and culture. reflecting on the newness that has emerged in the church in mission it has been a lot more fruitful where the new has been elsewhere - starting a new congregation alongside the old, or on the margins, or in someone's home. alternative worship communities flourished in precisely this way. beth keith has done some research into pioneers experience in the church and this bears this axiom out in startling fashion. and yet in many places the church is doing precisely the opposite especially when it comes to those who are ordained as pioneers. they are very often being put into structures and positions that require them to do lots of the old in those structures and the new out of that. this is a really hard ask. i won't say it's doomed to failure but I have huge questions about it. i assume it's for reasons that are to do with a mix of economic and imagination. last week i met lots of the guys involved in venture fx, a project in the methodist church to recruit and fund around 15 innovative projects in mission over 5 years. i loved the people and they seem to have got this right. their guys are being set free to do the new elsewhere. the c of e could learn something by watching. this axiom is also why together with cms i have sought to create a pathway for training pioneers that is in a different space, elsewhere and i believe that tactic is enabling us to create something genuinely innovative (i hope anyway - we're certainly not having to spend our energies fending off critique). this does of course raise a question. how elsewhere is elswhere? i'll say more about this in future posts. but I am not suggesting this means leaving organisations or cultures or denominations though that is a possible tactic. in my experience the track record of that trajectory is depressingly familiar with those who leave proclaiming themselves as the new prophets/radicals who twenty years later often look rather dogmatic and controlling, and is really ony a last resort. though I appreciate certain contexts may leave little choice. rather the elsewhere is about space to dream the new on the edges of what already exists. got a good idea for social transformation? When you want to be a great novelist, but you can’t face sitting at the laptop day after day, struggling to get the novel written, you are looking for a turtle with a moustache. When you want to be a great actress, but you avoid auditioning because you can’t face rejection, you are looking for a turtle with a moustache. When you want to be a famous artist but you think your art should sell itself, without any effort on your part, you are looking for a turtle with a moustache. Or when you want to have a thriving business, but don’t want to get your hands dirty with sales and marketing. Or when you love someone but wish they would change a few of their irritating personality quirks. Or when you want to be a successful blogger, but don’t hit ‘publish’ because you’re afraid of criticism. Whenever you want the juicy reward without paying the price, or facing the unpalatable truth, or doing the hard work, you are looking for a turtle with a moustache. Whenever you think your work exists in some kind of pure spiritual dimension that has nothing to do with the grubby realities of life, you are looking for a turtle with a moustache. when you want to be a pioneer but don't want to engage in issues of sustainability, ongoing support and structures - turtle with moustache! when you want to take on a role paid for by the church as a pioneer but don't want to engage in church politics - turtle with moustache! how about some creative thinking around this? the two open days went well for the new cms pioneer training course i am leading. someone asked me what an open day was - hadn't figured that the term wouldn't cross cultures! it's simply a day for people to come and visit and hear about the course, see the facilities and meet students and ask questions. we'll be having another one in may - the 19th is the most likely date - if you missed out this time round. Kaospilot in Denmark is an innovation school that looks wonderful! They have been a source of inspiration for me ever since I bumped into some students at a youth ministry conference I was speaking at in Denmark many years ago. They seem to have an open source policy and will be putting up materials on to their web space. You've got to hunt around a bit to find things but I suspect it's a bit of a treasure trove. Anyway I unearthed a gem that I have begun to use in conversation in the pub, with my family over a meal and probably lots of other places. I think I noticed it because of the reflecting we have been doing in the mission spirituality module on the course. I think it would be easy to dive straight in to this course with pioneers who are generally activists and think how can we make stuff happen and help them make stuff happen. But we've resisted that and our first two modules have been much more about who we are and how we reflect on that and who God is in relation to us and the world rather than what we do. In mission spirituality, Johnny Sertin who leads it has been getting us all to focus on who we are and what our unique contribution is to the world and out of that to write a mission statement. It's really hard to do but also been quite an important and powerful thing to focus on. I connect with and inspire creative leaders who don’t fit in, to help them be true to who they are and to do amazing things. pioneer training - prospectus and web site have landed! it's an exciting week (for me at least!) - the prospectus and web site for the cms pioneer mission leadership training are ready! the prospectus arrived from the printers on friday. the web site is here - http://pioneer.cms-uk.org and you can download a prospectus from there. we have open days tomorrow and wednesday (not too late to come along btw but let me know).